You may wish to paint your boat rope blue, or another bright color. 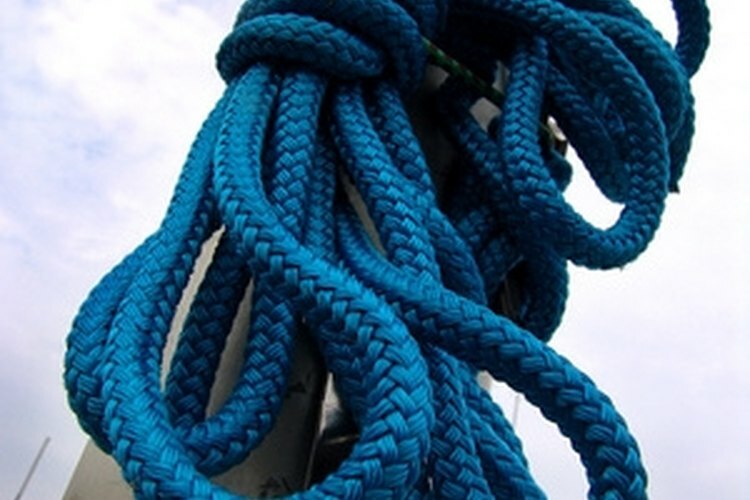 Polypropylene rope has several characteristics that make it useful aboard your boat: it floats; it's lighter than similarly-sized nylon or natural fiber rope; and it doesn't "snap back" when it reaches its breaking point. Made from a plastic fiber, it can be readily color-coded so you don't use your dock lines for some purpose other than tying your vessel to a pier. A paint job with a flexible trim paint will make sure that the lines you designate as your dock lines can't be confused with towing lines or lifelines. Lay out a drop cloth to protect your driveway from dripping paint. Set the rope drying rack in the center of the drop cloth. Drape the rope over the rope drying rack with long loops--but just short of touching the drop cloth--between each hanger of the rack. Prepare the paint by shaking the can vigorously for three to five minutes. When the "marble" inside the can moves freely, the paint is ready for application. Spray the surface of the rope with the paint, keeping you hand moving while spraying. Keeping your hand moving prevents paint build-up in one spot. The best way to make sure this doesn't occur is to begin moving your hand before pressing the spray valve. Allow the paint to dry for about one hour. Adjust the loops of rope so the unpainted areas that were resting on the rack hangers are visible and accessible, then paint those empty areas. Allow the paint you just applied to dry. Choose a warm, sunny, windless day to paint. The paint can will include a minimum temperature recommendation on the label to guide you. If you can't find a rope drying rack locally, substitute a wooden clothes drying rack. This project involves work with chemicals (paint). Appropriate cautions should be observed.